Jan. 13, 2019: International Space Station Configuration. 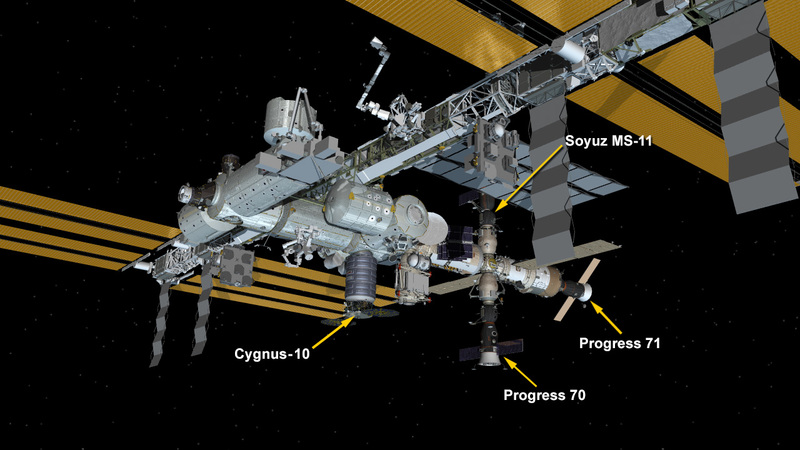 Four spaceships are parked at the space station including the Northrop Grumman Cygnus resupply ship and Russia’s Progress 70 and 71 resupply ships and the Soyuz MS-11 crew ship all from Roscosmos. The SpaceX Dragon cargo craft is back on Earth after splashing down in the Pacific Ocean Sunday night loaded with critical space research and International Space Station hardware. Four spaceships remain parked at the orbital lab including Northrop Grumman’s Cygnus resupply ship from the United States. Today, the three-member Expedition 58 crew is exploring a wide array of microgravity science to improve life for humans on Earth and in space. The orbital residents also worked on life support systems and upgraded computer hardware. NASA astronaut Anne McClain set up a specialized microscope in the morning for the Biophysics-5 study to research the production of protein crystals. Afterward, she deactivated Dragon communications gear then swapped out hard drives on several laptop computers. Flight Engineer David Saint-Jacques of the Canadian Space Agency opened up the Combustion Integrated Rack and replaced optics gear inside the flame and soot research device. He later swapped a hydrogen sensor inside the Oxygen Generation System before inspecting and cleaning some of its parts. A pair of tiny internal satellites, better known as SPHERES, were set up by Commander Oleg Kononenko today inside the Kibo laboratory module. High school students write algorithms and submit them in a competition to control the SPHERES to demonstrate spacecraft maneuvers and formation-flying for future space missions. How’s life up there? It must be awesome to live in space!